On the heels of announcing a double A-side single, Paul McCartney has now revealed the title of his forthcoming 17th solo studio effort, as well as shared the album's "I Don't Know" and "Come On to Me." Titled Egypt Station, McCartney's latest will arrive September 7 through Capitol Records. It marks McCartney's first album in five years, his first since 2013's NEW. That's the album cover for Egypt Station above. As promised, a pair of new tracks have arrived alongside the announcement. You can hear "I Don't Know" and "Come On to Me" in the players below. A post on McCartney's website reveals that Egypt Station will run 14 tracks in length, with titles including "People Want Peace," "Happy With You" and "Despite Repeated Warnings." 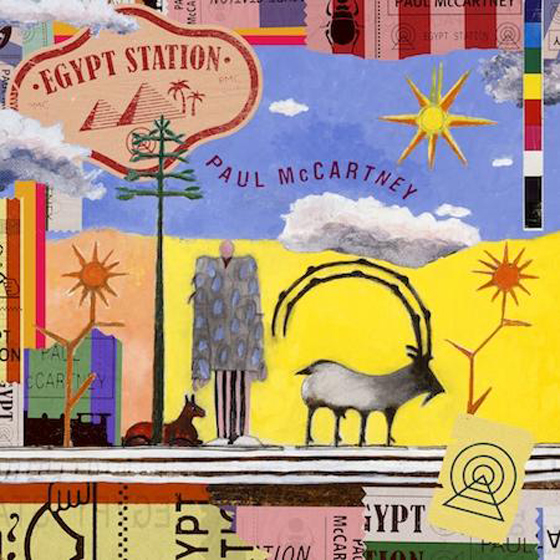 Of the album title, McCartney said, "I liked the words Egypt Station. It reminded me of the 'album' albums we used to make... Egypt Station starts off at the station on the first song and then each song is like a different station. So it gave us some idea to base all the songs around that. I think of it as a dream location that the music emanates from."